Cities played a key role in Canada’s recent federal election. New seats were available in many urban and suburban areas of the country after the House of Commons expanded to reflect recent population shifts and increases. Political parties also devoted large chunks of their platforms to cities in an effort to woo these voters. In some cases, their maneuverings began even before the campaign. 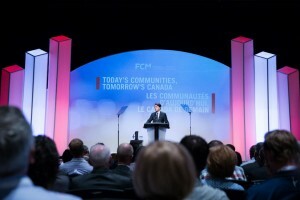 In June, Liberal leader Justin Trudeau spoke at the Federation of Canadian Municipalities Conference, promising a “New Deal” for cities and communities. Declaring that municipalities “still don’t have the resources they need to deliver the services that citizens expect”, Trudeau acknowledged that the federal government should be “held to its responsibilities, financial and otherwise” at the municipal level. During the election, he doubled down on this commitment by vowing to run budget deficits in his first three years and invest $125 billion over ten years in building and upgrading urban infrastructure. Reading these and other recent stories, one gets a sense from their language and tone that many Canadians see the federal government as a natural partner for cities that should be counted on to reliably support municipal needs over time. But historically this has not been true. Federal involvement in urban affairs only dates back to the late twentieth century and remains a work in progress, which can help to explain all the recent speculation about Trudeau’s future urban agenda and the potential departure it represents from the past. The 1867 BNA Act made Canada’s provinces, not the federal government, responsible for municipalities, and this arrangement largely went unchallenged until the 1960s. But by then, Canada’s urban population had ballooned substantially, having doubled between 1941 and 1966, and cities, as well as the provinces overseeing them, struggled to find money and resources to manage this steady growth. A rise in urban activism in the late 1960s increased the pressure for change, as grassroots figures, like Jane Jacobs, highlighted urban social and economic inequalities and criticized municipal governments for pursuing urban redevelopment projects in the name of progress that were costly, disruptive, and environmentally controversial. Aware of the stakes, these activists called on the federal government to directly intervene to protect the health of cities and the people living there. But even as these events transpired in the late 1960s, the federal Liberal government was reluctant to alter the status quo. Zachary Spicer notes that Prime Minister Pierre Trudeau, who came to power in 1968, initially resisted a greater federal role in urban affairs because he felt this violated provincial jurisdiction over cities and threatened the spirit of cooperation integral to Canadian federalism. Trudeau only reconsidered once his position became more unpopular in the early 1970s. By then, other Liberals had begun to openly question him and the opposition Progressive Conservatives had taken concrete steps to develop and promote a federal-urban policy of their own. Bowing to pressure, Trudeau publicly acknowledged that municipalities could now look to the federal government for concrete assistance and announced the creation of a Ministry of State for Urban Affairs in June 1971. But Trudeau’s change of heart did not entirely turn the page on federal-urban relations. After just eight years, he shut down the Urban Affairs ministry after it had ruffled provincial feathers and failed to have much of an impact. Federal policies towards cities continued to fluctuate in the coming decades. In the 1990s, the Liberals under Jean Chretien introduced austerity measures that cut funding across the board to decrease the size of the national debt. Some provinces, like Ontario, followed suit, downloading responsibilities for public housing and social services to municipalities, which made their job of protecting the quality of life in their communities even more difficult. Cities did receive some relief from the federal gas tax fund during Paul Martin’s brief tenure in the mid-2000s as part of his own “New Deal” program, but fared worse under Stephen Harper, who was more hostile to urban issues. Given this uneven track record, we can see recent interest in Trudeau’s New Deal program as part of a public push to stabilize federal-urban relations in a way that has historically proven elusive. This would clarify an arrangement that many already see as natural for both sides as Canada’s cities continue to grow and provincial assistance falls short. One can sense there is already broad agreement that cities need a federal New Deal and that not having one will have national repercussions. This consensus would have been unthinkable fifty years ago. But in an age where cities are competing more worldwide for power and prestige, supporters of a New Deal are less able to agree on what type of city it should be trying to help build. Should it primarily address the welfare of existing inhabitants? Or work to attract more foreign business and investment? Are both objectives possible at once? This debate essentially pits an older urban activism concerned with eliminating local inequality against a newer outward-looking civic identity that values a city by its level of affluence and international reputation. These tensions will continue to frame national conversations about our cities as Trudeau puts his own stamp on federal-urban relations over the next few years. Bret Edwards (@BretJEdwards) is a PhD candidate in History at the University of Toronto researching airports and aeromobility in late 20th century Canada.